Savvy buyers are expected to swoop when Crown Group releases the final stage of its popular Parramatta development, V by Crown Group, on Saturday November 21. The final apartment release will include studio, one-bedroom, one-bedroom-and-study and three-bedroom apartments; priced from $499,000. 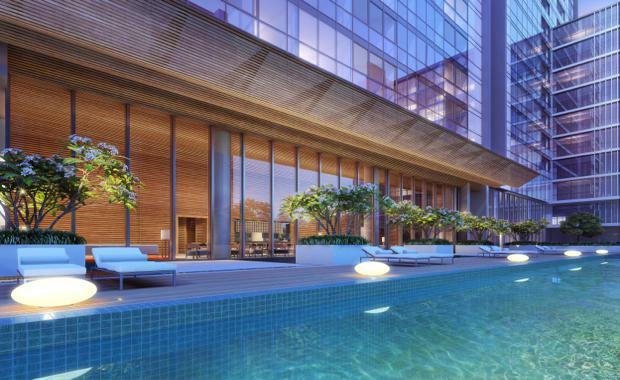 When complete, the $309-million 29-storey tower designed by Allen Jack + Cottier Architects, will feature 519 luxury apartments and resort-style facilities including a 25m lap pool, sauna, gymnasium, theatrette, library and wine room. Crown Group Project and Commercial Sales Director Anthony Falas said the early release of the V by Crown Group’s final apartments was prompted by an overwhelming demand for affordable luxury apartments in Parramatta. “We fast-tracked this release to cater to surging demand in apartments at V by Crown Group. "Demand from buyers has reached a tipping point; with first home buyers at the forefront,” Mr Falas said. “V by Crown Group’s final release includes some of the most affordably priced apartments in the project, with studio apartments starting from $499,000,” he said. Offering residents a pocket of calm and spectacular views, V by Crown Group will feature a landscaped communal garden on level 19. Mr Falas said V by Crown Group would be a vertical village of stylish urban homes; well-suited to buyers ready to embrace the future. “Young buyers are genuinely interested in apartment living and they’re actively looking for value-add amenities that make it a long-term lifestyle choice,” Mr Falas said. “V by Crown Group's affordability, coupled with its superb location amenities, sets it apart from other 'first homebuyer' locations. "When complete, V by Crown Group will feature a stunning ground-floor retail precinct comprising a selection of modern shops and restaurants and a state-of-the art heritage showcase. V by Crown Group is located on the corner of Marsden and Macquarie streets; a short walk from Church Street Mall, Parramatta train station, Parramatta Heritage Parklands and Westfield. “Young buyers are genuinely interested in apartment living and they’re actively looking for value-add amenities that make it a long-term lifestyle choice,” he said. "V by Crown Group’s affordability, coupled with its superb location and amenities, sets it apart from other ‘first homebuyer’ locations. "When complete, V by Crown Group will feature a stunning ground-floor retail precinct comprising a selection of modern shops and restaurants and a state-of-the art heritage showcase. Already the nation’s fifth largest economy, Western Sydney is projected to account for 60 per cent of Sydney’s growth in the next 25 years. The development is due for stage one completion in December 2016 and stage two in June 2017.